TechRadar Phone Awards: what went down at 2014's hottest phone event? There's always an amount of trepidation when you try something for the first time – thankfully, the TechRadar Phone Awards kicked off in brilliant style. 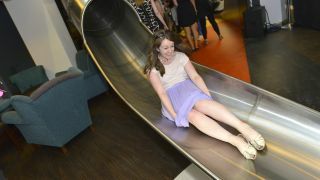 Held at the cool Ticketmaster offices, we had a bar, burritos, a piñata and even a slide, which more than a few brave attendees entered through. We had loads of the industry's best and brightest down to celebrate the best of the phone and tablet world, and all enjoyed the free-flowing food and drink on offer as Phones and Tablets editor Gareth Beavis and Editor in Chief Patrick Goss presented the awards on stage. We also had music from both an acoustic set by Blacky from The Howling and DJ set by Chas from The Hounds to really get the party started, with the winners and nominees partying together to make it a really memorable event. Before the action kicked off, we decided to get some old tech out, with the Nokia 3310 the star of the show in a 'fastest texter' competition. Qualcomm was the first to receive a TechRadar award, with the Snapdragon 801 SoC taking the best innovation ahead of Apple's TouchID and HTC's Boomsound, after much deliberation over which new feature in the last 12 months had really changed the phone landscape as we know it. Next up came the best app – a hotly-contested category that saw the likes of Sky Go, Swiftkey and Google Maps fight it out for the title, but hugely popular music app Spotify slipped ahead of the pack to take the award. Then came the battle of the budgets: both tablets and phones. It doesn't always have to be able the brilliant specs, as these lower-cost devices proved. Google (the most-nominated brand at the Awards, with four devices or services up for a gong) walked away with Best Budget Tablet for the awesome Nexus 7, beating out Samsung, Asus, Amazon and more to the title. In the budget phone category, it was a little Noah's Ark for the nominations: The Nokia Lumia 520 and 630, the Moto G and Moto E, and the EE Kestrel and Huawei Ascend G6 (the last two being variants of the same model). This was a very close category indeed, but Motorola's Moto G just snuck ahead of the two Nokias to take the crown – showing that you really can get some decent handsets for less cash these days. And finally, the two big awards: Best Tablet and Best Phone. The iPad Air took the gong for the former, with the Sony Xperia Z2 Tablet the closest challenger from the Android pack which saw entries from Amazon, Google and Samsung. In the Best Phone category, all entries from Samsung, Sony, Apple, OnePlus, LG and HTC were hoping to nab an award to reflect their efforts this year – and it was a tricky one to call. The OnePlus offers brilliant value, the LG G3 a great screen, Sony could have taken it with with the Xperia Z2 or Z1 Compact, and Apple and Samsung's popularity could have tipped them into top spot. But it was HTC's One M8 that emerged victorious, taking the crown for its brilliant blend of design, power, screen tech, ergonomics and sheer usability… can it possibly repeat the feat next year? So the first awards were a huge success, our chance to award the industry for all its hard work and thank the people we get to work with week in, week out, to bring you the best phone news, features and reviews. And there was a slide. Who doesn't love a slide?